PwP often experience an ever-quieter speaking voice, difficulty with enunciation and with swallowing. There are two therapeutic singing / musical programs for PwP and their care partners: Tremble Clefs and AudAbility. They’re so much fun, and have demonstrated benefits for voice, breathing and swallowing. And you don’t have to be able to carry a tune or read music! Tremble Clefs was created more than twenty years ago by Karen Hesley, who serves today as TC Board President. They recently incorporated as a non-profit. They have chapters in San Diego, Encinitas, Orange County, Phoenix, and other communities nationwide. Tremble Clefs establishes singing groups in which individuals share in a joyful activity with therapeutic results and work toward a common goal. 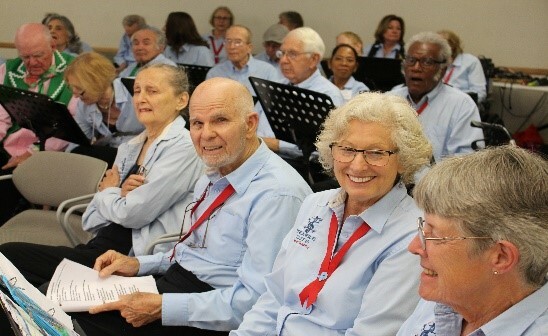 Participation in a Tremble Clefs singing program can help address voice and communications problems through breathing, stretching and posture activities, vocal exercise, rhythm and movement, and a strong social support system.